A precision engineered bike from a top brand that can help people push themselves a little harder. The York Perform exercise bike has been built for everybody, no matter their level of fitness. The seat and handlebars both adjust, so whatever size you are, you’ll be able to find a comfortable configuration. The bike can support upto 150kg, much more than other models, making it a great choice for larger people. The bike looks and feels durable and assembling it is easy. It can be done in less than an hour with all tools and comprehensive instructions provided. The bike has 32 levels of resistance and a 7kg flywheel. The onboard computer, which is mains powered, allows you to measure all the standard variables such as speed, distance, pulse rate and calories burned. In addition 19 built-in exercise programs mean you can keep your workouts varied and productive. 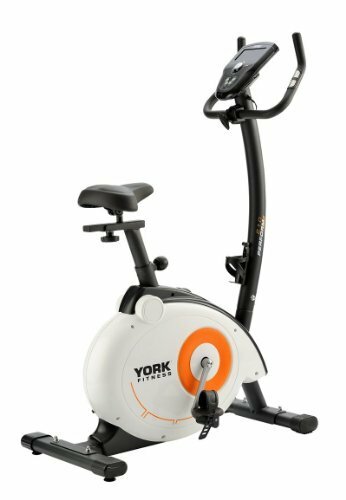 York Fitness are a well known brand in fitness and this model is a respectable mid-range effort from them. It has an ergonomical design and front wheels make it easy to move around despite it’s weight. It looks professional, has a sturdy frame and pedals to survive heavy use and even has a bottle holder, little touches that you won’t find on many other bikes in this price range. Reviewers have all agreed how well built and how quiet the bike is although some suggest having an extra person on hand to make assembly of the bike go more smoothly. While the overall comfort of the machine has been praised, the saddle has been roundly criticised for being painful to sit on after even a short time. The saddle fitting is standard sized however, so it can easily be replaced if gel pads or cushions don’t solve the problem. People looking for a machine built to last won’t be disappointed with this bike. Whether you’re just starting out and need to lose weight or you’re a fitness enthusiast and keen to stay that way, you’ll stay motivated experimenting with the different exercise programs to build the perfect workout plan. I’d be happy to recommend this model to anyone looking above the ‘basics’ level to get an exercise bike that is robust enough to keep up with you as you improve. Check out the product page now, and see the feedback from previous buyers (oh, and the latest amazon.co.uk discount!). See this page for a full list of exercise bike reviews and guides.